It is 1998, Margaret Campbell, an American Forensic Pathologist has left the USA, following a broken relationship, for Beijing, China on an initial six-week course to teach at the Police Academy. The opportunity had been given to her at short notice and she was very unprepared for the vast difference in language, customs, culture and general way of life there. Li Yan is the lead detective for the Beijing version of Scotland Yard and on his first case after just being promoted has to investigate the discovery of a grotesquely burned corpse discovered in a city park. In order to get to the bottom of this, he needs outside expert help and he discovers, to his dismay, that Margaret's speciality is the pathology of burns' victims. Initially, there is a lot of animosity between Margaret and Li Yan as they originally met when jet-lagged Margaret accidentally crashed her car into his bike. He tells her off in perfect English. This was particularly upsetting for him as he was on his way to the initial interview for the job of Deputy Section Chief. Turning up for the interview in soiled blood stained clothes at such an important time made him very resentful towards this foreign lady but fortunately it did not stop him getting the job. Li Yan and Margaret work together to try to discover the identity of the victim and whether it was suicide as everyone initially thinks or could it be murder? There are two other murders discovered at the same time but whether they are connected or separate cases needs also to be investigated. Margaret does the autopsy of the victim and is able with her expert knowledge to discover a great deal of useful information about the victim. She even telephones a contact in the FBI in the US for more information. The difficulty of investigating a criminal case in a communist state with all their strange (to Western eyes) customs and hierarchical traditions is explained very well by the author, who explains in extensive notes at the beginning of the book how often he has travelled on research trips to China over the years and how much it has changed. Li Yan lost most of his family during the Cultural Revolution and his last surviving main mentor is his uncle with whom he lives and discusses his cases, and gets the benefit of his insightful experience. The author manages to inject into the story, which is quite lengthy at 560 pages a lot of thoughtful, highly atmospheric descriptions of life in the new China. One could almost taste the contents of the wok the characters ate from as Li Yan took Margaret to various restaurants, during the case. The beautifully rich vocabulary that the author uses transports you immediately to China. As the case developed it became clear that the three victims that were initially investigated were just the tip of an iceberg that could lead to the death of millions, not only in China but around the world. 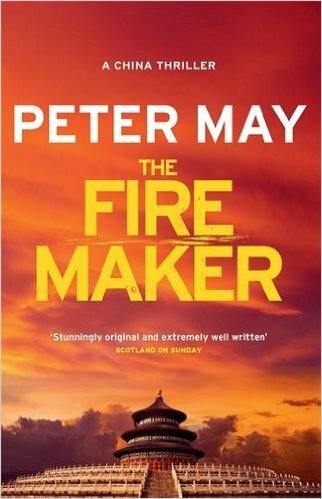 This is the first in a series of six books with these characters and was originally published in 1999; they are now being introduced to new readers such as me and I look forward to reading the whole series and also his Lewis Trilogy set in the Outer Hebrides. The quality of his writing is first class and I was very impressed as I have not had the pleasure of reading his books before. Extremely well recommended.